No action had yet been taken to remove the names of Sri Lankan leaders who had fought for freedom since 1815 from a list of traitors and rename them as national heroes, Parliament was told yesterday. Those who had launched the freedom struggle of 1818 and subsequently been branded traitors by British rulers could be removed from the list of traitors if the Ministries of Internal Affairs and Justice initiated action, UNP MP Buddhika Pathirana said. Pathirana said it was regrettable that even as the country was planning to celebrate its 70th Independence Day, the names of 19 Sri Lankan freedom fighters who fought the British in 1818 and consequently labeled as traitors to the Crown by the British, remained on the list of traitors, he said. "If Deputy Minister Palitha Thewarapperuma takes the initiative this can be made a reality. Do not worry about the land issue that may arise as none who make such claims are alive today. 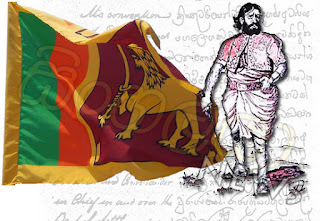 Nevertheless, the descendants of these patriots deserve their due respect and recognition," Pathirana said. In response, Deputy Minister of the Internal Affairs, Wayamba Development and Cultural Affairs, Palitha Thewarapperuma, said that according to the Gazette notification of January10, 1918 Keppetipola Disawe, Godagedara Disawe, Ketakele Mohottala, Kataragama Maha Bethmarala, Kataragama Kuda Bethmarala, Pallegolla Mohottala, Batakele Mohottala, Delgahagedara Rehenerala, Possara Watte Vidane, Kiule Gedara Mohottala, Yalagomme Mohottala, Udamedure Mohottala, Kohukumbure Raterala, Kohukumbure Walawwe Mohottala, Butawe Raterala, Baginigahawela Raterala, Maha Badullegammane Raterala, Balupitiye Mohottala and Palle Malahaye Gamaathirala had been branded traitors to the Crown by the British rulers. He said that the issue was more relevant to the Ministry of Justice than the Ministry of Internal Affairs, Wayamba Development and Cultural Affairs as there were legal provisions including matters relating to property which needed the involvement of the Ministry of Justice and that if those matters were resolved his Ministry could attend to the rest.